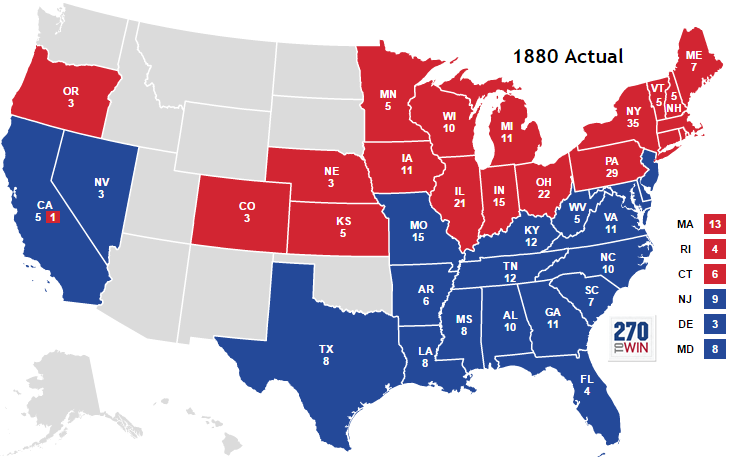 The election of 1880 was not one of the more exciting elections. That was, perhaps, just as well since the election of 1876 had generated enough excitement to last several election cycles. Neither candidate was particularly memorable and the party platforms of the two major parties were almost indistinguishable. The Republicans met in Chicago, from June 2-8, for what turned out to be the longest political convention in the party’s history. Because President Hayes had decided against running for re-election, the Republican Party was divided between Stalwarts, supporters of Ulysses S. Grant, who had decided to try for a third term as president, and Half-Breeds, who supported civil service reform and opposed the spoils system and the political machines that dominated both parties. These Half-Breeds, so called because the Stalwarts considered them to be only half Republican, supported the candidacy of James G. Blaine, the former Senator from Maine. Some other Republicans supported John Sherman, a former Senator from Ohio, Secretary of the Treasury under President Hayes and the brother of General William T. Sherman. None of these candidates could win a majority of the delegates, so the balloting went on and on until people began to support a relative unknown, James A. Garfield. Blaine decided to throw his support to his friend Garfield and Garfield finally won the nomination on the thirty sixth ballot. James A. Garfield was a Congressman from Ohio at the time of his nomination. He was, in fact, the only member of the House of Representatives to be elected president while still serving as a Representative. As a youth, Garfield had worked on a canal boat, earning him the campaign nickname, “Boatman Jim”. Garfield was smart and ambitious and began to consider a career in politics but when the Civil War broke out he fought on the side of the Union rising to the rank of Major General. Garfield was elected to Congress in 1862, where he served from 1863 to 1880. Garfield was probably one of the more intellectual candidates for president in the nation’s history, being the only president who proved a theorem in mathematics. He was also able to simultaneously write in Latin with his right hand and Greek with his left hand. Not very practical, perhaps, but still a neat trick. Garfield’s running mate was Chester A. Arthur. Chester A. Arthur was almost a symbol of everything that was wrong about American politics of the time. Arthur was a machine politician, rising up through the New York Republican Party, taking various civil service/political patronage jobs such as Customs Inspector of New York from 1871-1878. He was a good friend of Roscoe Conkling, the Senator from New York who controlled the patronage in the state. Arthur was a creature of the spoils system that men like Garfield were trying to eliminate. Chester A. Arthur did serve in the Union army as quartermaster, an important job, but again as a political appointee, and he made sure he was no where near any fighting. The Democrats held their convention in Cincinnati from June 22-24. 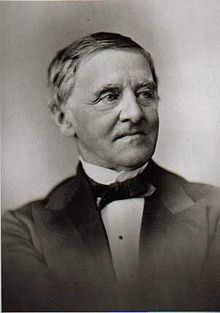 There was many Democrats who wanted Samuel Tilden to run again, but he didn’t really want to go through the stress and trouble of another presidential run. Instead, the Democrats nominated a Civil War hero, General Winfield Scott Hancock. Winfield Scott Hancock had served his country in the Army from 1844, fighting in the Mexican War and the Civil War, rising to the rank of Major General. Hancock had fought heroically at the Battle of Gettysburg, taking command of the left wing of the Army of the Potomac on the first day of the battle. He played a critical role in stopping the Confederate assault on the second day and was wounded on the third day. Hancock had little political experience, but the Democrats believed that nominating a war hero who was known to have opposed secession before the war would insulate them from the usual Republican post-war charges of being the party of treason and secession. Hancock’s running mate was William Hayden English, a conservative Democrat from Indiana. English had held several posts in the Indiana state government and served as Congressman from 1853-1861. During his terms in the House of Representatives, English was a voice of moderation, trying to prevent the country from breaking apart between North and South. After the election of Lincoln, English urged the Southern states not to secede. As a pro-Union Democrat, English would, like Hancock, deflect charges that the Democrats were the party of rebellion. There was a third party running in this election, the Greenback Party. The Greenback Party was a populist party which, as the name might indicate, believed that print paper money, or greenbacks, not backed by gold or silver. The federal government had first begun to print greenbacks backed by federal bonds during the Civil War. Thus policy caused the first protracted period of inflation in the United States since the time of the Revolutionary War. This inflationary outcome was precisely what the Greenback Party wanted, since it would result in farmers receiving higher prices for their produce and debts to decrease in real value. The Greenback Party was also in favor of such radical proposals as an eight-hour workday and suffrage for women. The two main parties were largely in agreement on the main issues of the day. Both the Republicans and the Democrats supported hard money, or money backed by gold. Tariffs were the major point of contention between the two parties, and even there there disagreements were mostly on minor details. In this time before the income tax, tariffs were the major source of revenue for the federal government. The Republicans wanted high tariffs to protect American manufacturers. The Democrats wanted lower, but still high, tariffs solely for revenue. Immigration was another issue in which the parties were in agreement, in particular immigration from China. Everyone wanted to limit Chinese immigration because it was believed that the Chinese workers’ willingness to work for extremely low wages would depress wages for workers generally. No doubt prejudice against people who came from a very different cultural background also played a role. As far as I can tell, no one proposed building a wall along the Pacific coast and making China pay for it, though. The election turned out to be a close one with James A. Garfield getting 4,446,158 (48.27%) popular votes against Winfield Scott Hancock’s 4,444,260 ( 48.25%) popular votes. James B. Weaver got only 308,649 (3.35%) votes. The Electoral College was somewhat more lopsided. Garfield swept the North and Oregon in the West gaining 214 electoral votes while Hancock won in the South, California and Nevada winning 144 electoral votes. There were some reports of irregularities, as in the election of 1876, but Garfield’s victory was decisive enough that it didn’t matter. Garfield didn’t live to serve a full term as president. Garfield was shot by Charles Guiteau on July 2, 1881, just three months after his inauguration. Garfield managed to linger until September 29 before finally dying. Reform minded people throughout the nation were dismayed at the prospect of the machine politician and Conkling crony Chester A. Arthur succeeding to the presidency. They need not have worried though. As soon as he took the oath of office, President Arthur underwent a complete metamorphosis in morals and politics. He turned against the spoils system and fully supported civil service reform, signing the Pendleton Civil Service Reform Act in 1883. He wouldn’t even give his old pal Roscoe Conkling the time of day. Arthur turned out to be a decent president, considering that no one ever really wanted him to get the job. The election of 1876 was one of those elections like the election of 1824 in which the loser of the election became the president. Unlike such previous disputed elections, such as the elections in 1824 and 1800, the problem in 1876 was not that no candidate achieved a majority there were only two candidates, or that there was some quirk in the electoral process. The problem with the election of 1876 was a combination of outright fraud and confusion in counting the ballots in the three remaining states of the former Confederacy that were still occupied by federal forces; South Carolina, Florida, and Louisiana. The year 1876 was the centennial of the United States. The year began with great celebration for the one hundred years that the nation had been independent. The feelings of most people were optimistic and cheerful about the future. America had, to be sure, fought a terrible Civil War only a decade before, and the South was still rebuilding. Still,the country was prosperous and at peace, and was rapidly settling the West. The campaign season began well. President Ulysses S. Grant had wanted to run for a third term but between the two term tradition and the series of scandals that had marred his administration, there was little enthusiasm for Grant. In fact the most important issue of the election was reforming the civil service and ending corruption in government. Therefore, both parties wanted reforming candidates untouched by any unsavory associations. This ruled out Congressman James G. Blaine, a Republican from Maine who had had some apparently unethical dealings with the Union Pacific Railroad. Instead, the Republicans nominated Rutherford B Hayes, the reforming Governor of Ohio. The Democrats nominated Samuel J. Tilden from New York. He had prosecuted Boss Tweed when he served as District Attorney and as Governor, he had fought the Canal Ring. The candidates were both honest men and there wasn’t much difference in the two party platforms, so naturally, to keep things interesting, both sides attacked each other ferociously, making this election one of the nastiest elections in history. The Democrats were delighted to point out the corruption in the Grant administration and in the Reconstruction governments in the South. The Republicans accused the Democrats of being traitors who had supported the Confederacy during the war. The real fun though, did not begin until after the election. When the votes were counted, Tilden won the popular vote over Hayes by 4,300,000 to 4,000,000. The electoral vote was what counted, though, and here things were less certain. To win in the electoral college required 185 votes. Tilden received 184 votes, mostly in the south but including New York and Indiana, while Hayes got 165 votes in the north and west. There was a problem with four states; Oregon, South Carolina, Florida, and Louisiana. Oregon was relatively simple. Hayes had won the popular vote there, but one of the electors was a postmaster and the constitution does not permit federal office holders to be electors. The Democratic governor of Oregon selected a Democrat to replace him. The Republicans announced that Hayes had won Oregon’s three electoral votes, while the Democrats insisted that the correct count was one for Tilden and two for Hayes. The Southern states were more difficult. To say that the elections were marked by fraud would be a tremendous understatement. There was marked voter intimidation. The Democrats tried to keep as many Blacks from voting as they could, while the Republicans tried to make sure the Blacks could vote as many times as they wanted. There was bribery, ballot box stuffing, and outright fraud. It will probably never be certain who actually won in South Carolina, Florida and Louisiana but Louisiana and Florida sent in two sets of returns while Florida managed to come up with three. Congress had the responsibility of deciding which returns accurately reflected the votes in the disputed states. It was an act that would be sure to create controversy no matter what they decided. As it happened the House of Representatives was controlled by the Democrats, while the Republicans had the majority in the Senate. The two houses fought bitterly but finally agreed to establish an Electoral Commission composed of five Senators, five Representatives, and five Supreme Court justices. Eight of these men were Republicans and seven were Democrats, and somehow all of their votes ended up being 8 to 7 in favor of Hayes, making Rutherford Hayes the next president. Naturally, the Democrats were not at all happy with this result, especially in the south. They accepted the decision of the commission without any serious trouble though. Tilden urged acceptance of the decision and many southern Democrats came to believe that Hayes was a president they could work with. Democratic leaders met with their Republican counterparts, even while the commission was working and agreed to accept whatever the decision of the commission might be in exchange for the next president agreeing to remove the remaining federal troops out of the South. The compromise of 1877 preserved the Union and ended what could have been a very messy political crisis. It also ended the Reconstruction Era and helped to heal the divisions caused by the Civil War. Unfortunately it also meant abandoning the cause of civil rights for the freed slaves. Southern Democrats swiftly took control of the southern state governments and disenfranchised the Blacks as soon as they could. They would have to wait almost another century to get there rights. 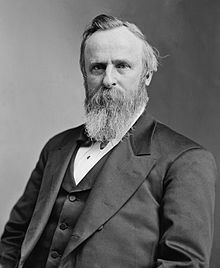 Rutherford B. Hayes turned out to be a decent president who pushed for civil service reform. He wasn’t able to do very much because of the circumstances of his election and decided not to run again in 1880. As it happened, electing a man with no political experience to the presidency might not have been a very good idea, even if the man was Ulysses S. Grant, one of the best generals in American history. Grant’s presidency was not the disaster it has often been made out to be. The Grant administration had some solid accomplishments to its credit. Grant consistently upheld the civil rights of the freed Blacks in the South and used federal troops to crush the Ku Klux Klan. Grant sought, not very successfully. to ensure that the Native Americans were treated with some degree of justice. I suspect that the poor reputation as a general and president that Grant has had for most of the twentieth century was the result of Southern historians, the same ones who concocted the Lost Cause mythology, blackening Grant’s reputation as revenge for his defeating their idol Robert E. Lee and standing up for the rights of the former slaves. Recently, Grant’s military reputation has been rehabilitated by military historians who now see him as a masterful strategist and I hope that political historians will follow suit. That being said, no one is likely to list Ulysses S. Grant as one of the top ten Presidents of the United States. The problem was that Grant turned out to be a remarkably poor judge of character, at least in the civilian sphere. Grant himself was honest, but many of the men he appointed to office were not. Because this was the time before civil service reform when the Spoils System was still in operation meaning that almost every government post was a political appointee. If an incoming president appointed corrupt men, it didn’t take very long for the whole government to become thoroughly corrupt, which is what happened in Grant’s first term. Despite several scandals, Grant was still personally popular and there was no question that the Republican Party would nominate him for a second term. A number of the more liberal Republicans were sufficiently disgusted with the corruption in the federal government and dissatisfied with Grant’s Reconstruction policies to separate themselves from the Republican Party to form the Liberal Republican Party. This new party, which included such prominent Republicans as Ambassador to Britain to Charles Francis Adams, Supreme Court Justice Salmon P. Chase, and Senator Carl Schurz from Missouri held its convention in Cincinnati from May 1-3. There they nominated Horace Greeley, the founder and editor of the New York Tribune for the presidency. Greeley was an unexpected and somewhat unusual choice for the nomination. He was not really a politician, only having served a brief term in Congress back in 1848-1849. He had been one of the founders of the Republican Party and may have given the party its name. He was chiefly a newspaper man however and was used to speaking his mind on every subject. People often say that they want a candidate you says what he really thinks, but they are lying. What people say is that they want a candidate who says what they want to hear and Greeley was not that man He simply didn’t know when to keep quiet or carefully parse his words as an experienced politician learns to do. This openness would not help him during the campaign. The Liberal Republicans went on to nominate Benjamin G. Brown, the liberal Governor of Missouri. Like Greeley, Brown had been one of the founders of the Republican Party and had served as a Senator from Missouri from 1963-1867 and then Governor from 1871-1873. Brown had served in the Union Army from 1861-1863 before being appointed Senator to fill a vacancy left by the departure of his pro-confederate predecessor. The Liberal Republicans adopted a platform which attacked the corruption of the Grant administration, supported civil service reform and ending Reconstruction and the military occupation of the South. They had some problems with the important issue of protective tariffs, but they made some vague statement about it being up to the people to decide. The Republicans met in Philadelphia from June 5-6. They nominated Grant for reelection by acclamation on the first ballot. Grant’s nomination was seconded by William Henry Grey, the first African-American to address an American political convention. Vice-President Colfax was dropped from the ticket because of his suspected involvement with the Credit Mobilier scandal and the convention nominated Senator Henry Wilson of Massachusetts in his place. Senator Wilson had long been an anti-slavery activist and was a founder of the Free Soil Party, the predecessor to the Republican Party, which he also helped found. Wilson had served in the Massachusetts House of Representatives and Senate, before going on to serve in the U.S. Senate from 1855-1873. As the Chairman of the Senate Committee on Military Affairs from 1861-1973, Wilson had played an important role in the Union’s war efforts. The Republicans went on to adopt a platform praising Republican achievements since 1861. The Republican platform made some mention of civil service reform and tariffs, without too many details on either subject, and favored the protection of the civil rights of all citizens in every part of the country. The Democrats met in Baltimore from July 9-10, and promptly nominated the Liberal Republican ticket and platform. At only six hours, the Democratic National Convention of 1872 was the shortest political convention in American, and possibly world, history. It might seem strange that the Democrats did not nominate candidates who were actually Democrats, Horace Greeley had been an especially fierce critic of the Democrats, but they wanted to see Grant out of office and believed that nominated their own candidates would only have split the anti-Grant vote, allowing him to win. It didn’t turn out to be an especially good plan. The campaign was a nasty one, as usual. Grant was assailed as an ignorant, corrupt drunkard. Grant remained silent, preferring not to actively campaign, but his supporters had plenty of ammunition to use against Greeley. During his long career as editor of the New York Tribune, Greeley had endorsed any number of fringe causes; socialism, utopian communes, vegetarianism etc, and the Republicans had a field day making fun of his eccentricities. It probably wouldn’t have mattered even if the Democrats had nominated someone more, well, normal. Grant was popular enough among regular Republicans, bankers and industrialists, Civil War veterans, and Blacks, that he would have probably beaten any Democrat. In the end, Grant won in a landslide with 3,598,235 (55.6%) popular votes against Greeley’s 2,834,761 (43.8%). The electoral vote was even more lopsided. Grant won all but six states gaining 286 electoral votes. Greeley won just Maryland, Kentucky, Tennessee, Georgia, Missouri, and Texas, for a total of 66 electoral votes. Arkansas and Louisiana had voted for Grant but the electoral votes were rejected due to irregularities arising from Reconstruction and so weren’t counted. Horace Greeley took his defeat hard. He became ill and died just three weeks after the election, before the Electoral College met to cast the official ballots. This created the unprecedented situation in which a presidential candidate had died before the election was formally concluded. The Democratic electors resolved the issue by simply casting their votes for four other candidates. I can’t help but wonder what would have happened if the victor of the popular election had ever died before the Electoral College met. 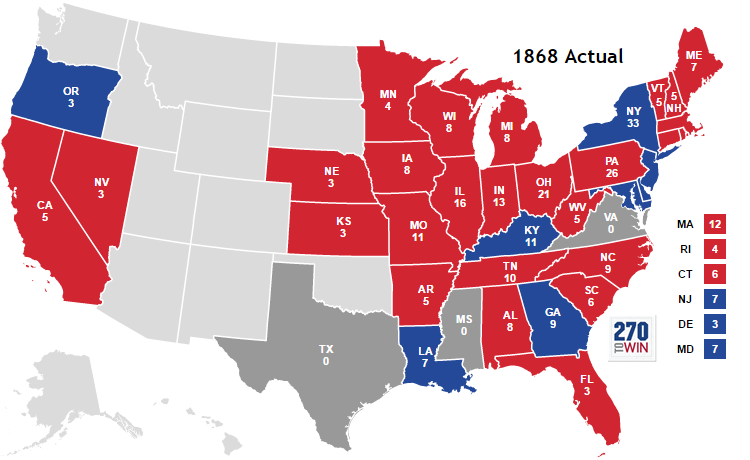 Perhaps the most remarkable thing about the election of 1864 is that is happened at all. The nation was in the middle of the worst crisis in its history, a bloody civil war. No nation had ever conducted elections in such circumstances before and it would not have been unexpected for President Lincoln to postpone the election until the end of the war. Lincoln must have been tempted. As 1864 began. he knew that he had little chance of winning reelection. Both the president and the war had become very unpopular. It is true that the twin Union victories at Gettysburg and Vicksburg the previous July had been turning points in the war that had made Southern defeat all but inevitable, but no one knew that at the time. All they knew was that the war was dragging on month after month with seemingly nothing to show for all the death and misery. Whatever thoughts Abraham Lincoln might have had about his upcoming defeat, he doesn’t seem to have considered the possibility of cancelling or postponing the election. In his view, the whole point of the war was to preserve the free, democratic government of the people, and postponing the election would mean that the rebels had won. It wasn’t even clear that Lincoln would win the Republican nomination. Many prominent Republicans, most notably Horace Greeley and Salmon P. Chase thought so little of Lincoln’s chances that they called for him to step aside and allow the Republicans to nominate someone who actually had a chance of winning. On May 31, 1864 several hundred of the more radical Republicans assembled in Cleveland, Ohio to form what they called the Radical Democracy Party. They believed that Lincoln was being too soft on the South and took a hardline anti-Confederate, abolitionist position. The Radical Democracy Party did not really expect to win the election. Instead, they hoped to force the Republicans to choose someone other than Lincoln. To this end, they nominated John C. Fremont, the Republican candidate for president in 1856, for president and war Democrat General John Cochrane for Vice-President. Fremont and Cochrane suspended their campaign in September to avoid becoming the possibility of dividing the vote resulting in a Democratic victory. The remaining Republicans met in Baltimore on June 7-8, along with some War Democrats to form the National Union Party. Lincoln was nominated for a second term on the first ballot and the party platform called for the end of slavery and vigorous pursuit of the war until the succeeding states were defeated. The convention then selected the Democrat Andrew Johnson as a show of national unity. Andrew Johnson was a little unusual in Southern politics since he did not come from the established, slave-owning,planter aristocracy like most Southern politicians. Johnson had been born in poverty among the lowest class of Southern Whites, but he was smart, ambitious and hard working. He entered Tennessee politics as a champion of the working men and became a Congressman from 1843 to 1853, Governor of Tennessee from 1853 to 1857 and finally Senator in 1857. Because of his humble origins, Andrew Johnson had little use for the secessionist sentiments held by many Planters was the only Senator from the South not to resign his seat when his state seceded. It should not be thought, however, that Johnson was opposed to slavery or at all sympathetic to the Black slaves. Johnson, like most of his class, despised the Blacks worse than the Planters, who at least saw their slaves as useful servants. Johnson’s bigotry would not serve his country well in the years after the Civil War. The Democrats, for their part, met in Chicago from August 29 to 31. The Democrats were split between War Democrats who supported the war against the South and Peace Democrats who either favored a negotiated end to the war with the South rejoining the Union or who were outright Copperheads, or Southern sympathizers. The Peace Democrats wrote the party platform, declaring the war a failure and calling for an immediate, negotiated end to hostilities, but the convention nominated General George B. McClellan, former commanding general of the Army of the Potomac for president. George B. McClellan had no political experience but he was an excellent officer with a distinguished record of service in the Mexican War and the Civil War. In many ways, McClellan was a great general. His experience working with railroads between the wars helped him to set up the supply lines to feed and arm the Union armies. He trained and drilled the Army of the Potomac into the military force that would ultimately defeat the Confederates. He loved the men and they loved him. McClellan had only one fault. He did not want to fight. This is one of the great mysteries of the Civil War, McClellan’s strange reluctance to lead his men into battle. He was always delaying. He was not a coward on the battlefield, but it may be that he feared failure. Perhaps he believed the exaggerated estimates of Confederate numbers, or he believed the myth that Robert E. Lee was an unbeatable genius. Whatever the reason, McClellan’s “slows” finally exasperated Lincoln to the point that he relieved McClellan of his command twice, so there may have been an element of personal satisfaction in McClellan’s decision to run against his former Commander-in-Chief. After selecting a War Democrat as their presidential nominee, the Democrats balanced the ticket by selecting anti-war Democrat Ohio Congressman George H. Pendleton. Pendleton had served in the Ohio Senate from 1854 to 1856 and then the US House of Representatives from 1857 to 1865. Pendleton had been a staunch supporter of state’s rights and so was against a war to bring the seceded states back into the Union. As one might expect, the presidential campaign of 1864 was a nasty fight. The opposition press had never been kind to Lincoln, routinely calling him a tyrant and a dictator and they didn’t let up for the campaign. Lincoln was said to be an ignorant, backwoods lawyer who delighted in telling indecent jokes. He was a tyrant and a butcher whose incompetence caused the nation to fight losing war. The Republicans responded by calling the Democrats defeatists, cowards, and traitors who sympathized with the Rebels. This didn’t seem like much of an exaggeration with the Democrat’s peace platform all but calling for peace at any price. McClellan, to his credit, rejected the Democratic call for peace stating that he could not look his comrades in the army that had sacrificed so much and tell them it was all in vain. The nation was so weary of a seemingly endless and bloody war that peace at any price seemed very attractive and few people doubted that Lincoln would be defeated. Lincoln himself certainly didn’t and he began to make preparations for the inevitable transition. The political situation changed almost over night with the capture of Atlanta by General William Sherman on September 2, followed up by Sherman’s March to the Sea This Northern victory coupled with Union advances elsewhere seemed to show that an end to the Civil War with a Northern victory was in sight, shifting public opinion decisively in favor of Lincoln. The results of the election in November were not even close. 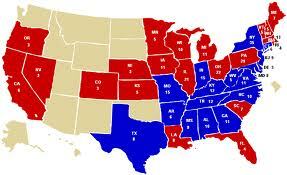 Lincoln won 2,218,388 popular votes (55%), a decisive majority and won all but three states for 221 electoral votes. McClellan got 1,812,807 votes (45%) and won only Kentucky, New Jersey, and Delaware giving him only 21 electoral votes. Naturally the seceded states did not vote in this election, although Louisiana and Tennessee were under military occupation and did participate. Their electoral votes were not counted. Lincoln had a clear mandate to continue the war until the Rebels were defeated. By the time Lincoln was inaugurated for his second term on March 4, 1865, Southern defeat was inevitable, although the Confederates kept fighting for another month. On April 2, Richmond, the Confederate capital was taken and on April 9, General Lee surrendered to General Grant, effectively ending the American Civil War. Lincoln didn’t get to enjoy the peace for long. 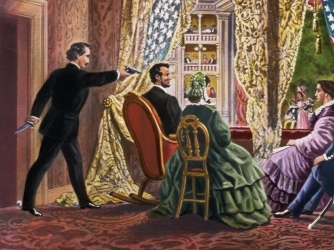 On April 14, Lincoln was assassinated by John Wilkes Booth and Andrew Johnson became president. The Election of 1860 was, without doubt, the most contentious election in American history, ending as it did with the secession of the South and the Civil War. For democracy to work, the loser of an election, along with his supporters have to be willing to concede to the winner. This can happen as long as the consequence of an election is not an existential threat to the lives and liberties of the losers. For the first, and so far only, time in the history of the United States a large portion of the electorate simply refused to accept the results of a democratic election, in part because they feared the results would be destructive to their way of life. How did it come to this, that the South so feared the election of Abraham Lincoln that it was willing to secede from the Union and risk war? Slavery had been an increasingly divisive issue for decades, yet the nation had always managed to find some sort of compromise to pull back from the brink. There had been talk of secession since the beginning of the Union, but it was mostly talk. No one seemed willing to take the fateful step to dissolve the Union before 1860. After his election in 1856, President James Buchanan had even dared to hope that the contentious slavery debate would be settled by the of his term and peace and prosperity would be the rule. He could not have been more wrong. In fact, it was during President Buchanan’s administration that a series of events occurred that made Civil War if not inevitable, certainly increased sectional tensions to the breaking point. Historians generally hold that the Civil War began when Confederate Army fired on Fort Sumter on April 12, 1861, yet in a way the Civil War had actually started almost a decade earlier in Kansas. As early as 1854 fighting had broken out between pro and anti-slavery settlers in the Kansas Territory. The Kansas-Nebraska Act had called for popular sovereignty to decide whether Kansas would be Slave or Free. Settlers from North and South poured into Kansas attempting to get a majority for their side. Election fraud was rampant and neither side was willing to concede to the other, resulting in two separate territorial legislatures. It wasn’t long before violence broke out, egged on by radicals back east only too willing to supply arms. Then there was the Supreme Court’s decision in Dred Scott vs. Sanford, announced just two days after President Buchanan’s inauguration. This decision which overturned the Missouri Compromise of 1820 and denied the right of Congress to outlaw slavery in the territories delighted the South and infuriated the North. Because of this ruling, slavery could no longer be contained to southern territories but could spread north. Even worse, because the Court decided that Dred Scott was not free just because his master had taken him to a state where slavery was illegal, opened the door to the possibility that state laws forbidding slavery might be effectively overturned since freeing the slaves of a person who moved North could be construed as unlawfully depriving him of his property. Chief Justice Roger Taney and President Buchanan hoped that the Dred Scott decision would settle the issue of slavery once and for all, but the uncompromising nature of the decision only made things worse. Finally, there was John Brown’s raid on the federal arsenal at Harper’s Ferry on October 19, 1859. I don’t think the Northern abolitionists had any idea how afraid the slave owners of the South were of their own slaves. While Southern apologists depicted the Blacks as simple minded creatures, perfectly content with slavery in their propaganda, anyone who had much contact with the slaves must have known how much they resented their servitude. They had good reason to fear that the Black slaves would take a terrible revenge if they ever got the chance. When the abolitionists demanded that slavery be ended, the Southern Whites, only heard a call for their own destruction. When a terrorist from Kansas tried to incite a slave insurrection only to be hailed as a hero and a martyr by sympathetic Northerners, the Southerners must have seen their worst fears confirmed. By the election of 1860, it must have seemed that the United States could no longer be half Free and half Slave. Either slavery would be abolished, along with a way of life that benefited the Southern elite, or slavery must spread to every part of the nation. Little wonder a Civil War resulted. The Democratic convention was held in Charleston South Carolina in April. Since President Buchanan declined to run for reelection, the most obvious candidate was Stephen Douglas from Illinois. Douglas had served in the House of Representatives from 1843 to 1847 and then in the Senate from 1847 until his death from typhoid fever in 1861. Stephan Douglas is best known today for his famous debates with Abraham Lincoln during the Senatorial election of 1856. He was a great believer in democracy, believing that popular sovereignty should settle the slavery issue in the territories. Douglas tended to oppose the Dred Scott decision, but had to be careful lest he alienate the South. This “pro-choice” did not please the Southern delegates at the convention who wanted a party platform that specifically protected slavery. This Douglas and the Northern delegates would not agree to and the convention broke up. This was not a good sign. The Democrats met again the following month in Baltimore. Again the Northern and Southern delegates could not agree on a candidate or a platform, so they held separate conventions. The Northern delegates nominated Stephen Douglas, as expected, and selected Herschel V. Johnson, the governor of Georgia from 1853-1857. Their platform called for popular sovereignty in the territories. The Southern delegates nominated Vice-President John C. Breckinridge for President and Joseph Lane, one of Oregon’s first two senators, for Vice-President. They supported a platform demanding federal protection of slavery in the territories. Meanwhile, the Republicans held their convention in Chicago from May 16 to 18. Abraham Lincoln was not really one of the leaders of the Republican Party. The more prominent Republicans who were expected to get the nomination included Senator William Seward of New York. Governor Salmon P. Chase from Ohio, and Senator Simon Cameron from Pennsylvania. Lincoln’s political resume was thin compared to these leaders having only served in the House of Representatives from 1847-1849 and in the Illinois Legislature form 1834-1842. However, each of these leaders had made enemies and had alienated one faction or another of the party. Lincoln, in contrast was well liked and known to be a good debater. The Lincoln-Douglas debates of 1856 had attracted national attention. Lincoln was also a shrewd politician and while he was against slavery, he was not as radical as some Republicans. Lincoln was nominated on the third ballot and Senator Hannibal Hamlin of Maine was selected as his running mate. Then, because things were not confusing enough with three candidates, a group of former Whigs, along with a few Democrats and former Know-Nothings met in Baltimore on May 9 to organize the Constitutional Union Party. This party was for preserving the Union at any cost, and not much else. They were silent on the slavery question, perhaps hoping to make the controversy go away. The Constitutional Union Party nominated John Bell, who had served as Senator from Tennessee from 1847-1859. Bell had begun his political career as a Democratic supporter of Andrew Jackson, then he split with Jackson to become the leader of the Whig Party in Tennessee. By the 1850’s he had begun to create a third party composed of moderates from both the North and South in an effort to alleviate the increasing sectional tension. Bell’s relatively moderate views on slavery made him unpopular in the South, though he had some appeal in the border states. The Constitutional Union Party went on to nominate former Senator from Massachusetts, Edward Everett as Bell’s running mate. 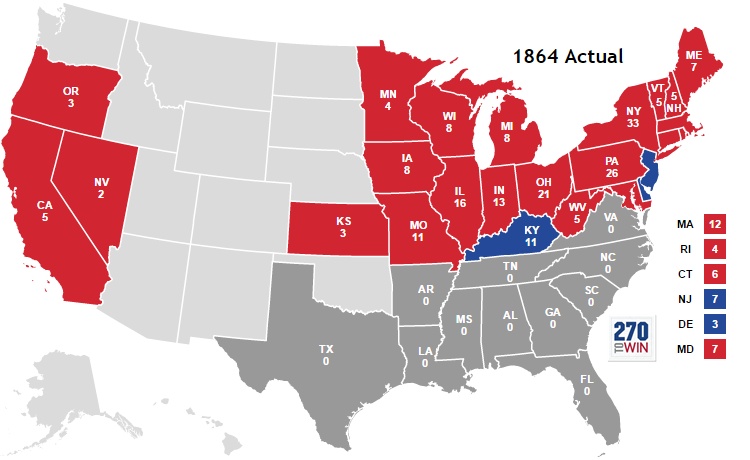 Since the Democratic party was split and Lincoln wasn’t even on the ballot in the South, the the election of 1860, was essentially two separate contests, Lincoln vs Douglas in the North and Bell vs Breckinridge in the South. As one might imagine, this turned out to be an exciting and tumultuous election, with all the hoopla of American politics in the nineteenth century. Stephen Douglas broke with tradition and actually went out to campaign in person, in the South as well as the North. In the South, he pleaded for the Southerners to accept the results of the election, no matter who won. They didn’t listen. Southern newspapers continued to run editorials promising secession and war if the “Black Republican” Lincoln were elected. The other candidates stayed at home and tried to look dignified and presidential but their supporters made up the difference in raucous energy. Bell’s supporters rang bells at rallies. Republicans were the most enthusiastic, holding parades featuring rails that the great rail splitter Abraham Lincoln had personally split. If it weren’t for the great seriousness of it all, it would have been a lot of fun. None of the four candidates got a majority of the popular vote, but Lincoln won a plurality with 1,865,908 votes or 39.8% of the total. Douglas came in second with 1,380,202 votes (29.5%). Breckinridge was third with 848,019 votes (18.1%C) and Bell came in last with 590,901 votes (12.6%). It is slightly ironic that if the Southern Democrats had supported Stephen Douglas, he might have won the election. By leaving the convention and nominating their own candidate, they virtually guaranteed a victory for Lincoln, the one candidate they could not accept. 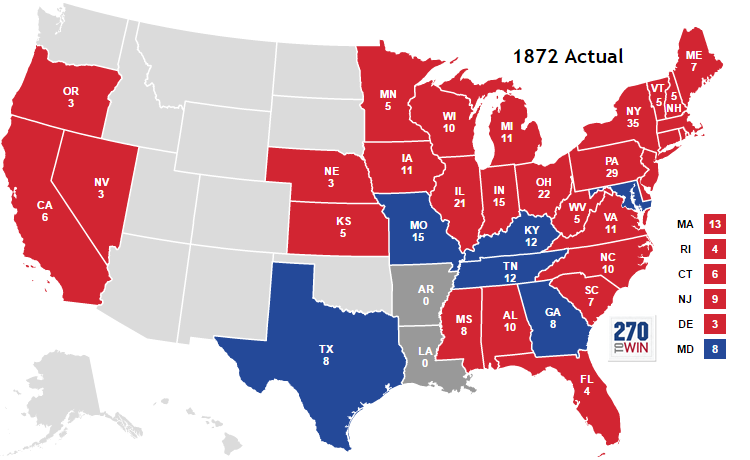 The Electoral vote was more decisive, with Lincoln getting a comfortable majority. The vote was divided along sectional lines. Lincoln won the entire North and West except for New Jersey, getting a total of 180 electoral votes. New Jersey split its seven votes giving four to Lincoln and three to Douglas. Douglas was second in the popular vote, but last in the Electoral College winning only Missouri’s nine votes and three of New Jersey’s for a total of 12 electoral votes. Breckinridge won all the Southern states, except for Kentucky, Tennessee, and Virginia, and got a total of 72 electoral votes. Bell won those three states with 39 electoral votes. Stephen Douglas realized that a Lincoln victory would divide the country and immediately after the election he traveled south and gave speeches supporting the Union. It didn’t work and on December 20, 1860 South Carolina formally succeeded from the Union. Soon, the other Southern states followed and America’s bloodiest war began. 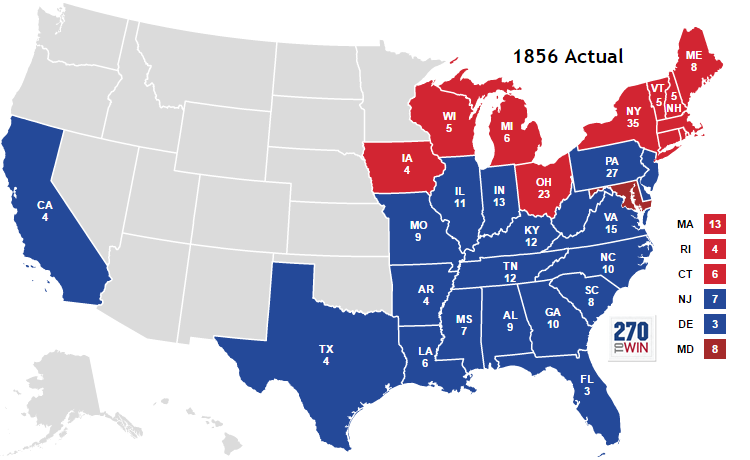 The election of 1856,may have been one of the most important elections in American history. The country was beginning to tear itself apart over slavery and wise, tactful leadership was needed to avert a civil war. Unfortunately the political generation that had produced such legislative giants as Henry Clay and Daniel Webster had passed away the candidates of both major parties, the Democrats and the newly formed Republicans in their first presidential contest, were mediocrities. The Compromise of 1850 had only delayed the inevitable clash between North and South over slavery. Although the immediate issue of whether the territories won from Mexico would be slave or free territories, the provision that the territories themselves would make the choice to permit slavery through popular sovereignty effectively repealed the Missouri compromise and made future conflicts over the expansion of slavery more likely. When the Kansas-Nebraska Act of 1854 created the territories of Kansas and Nebraska and permitted popular sovereignty on the slavery question, pro and anti slavery settlers poured into Kansas and began fighting a miniature civil war, foreshadowing the greater war to come. The Democratic National Convention was held in Cincinnati on June 2. The delegates declined to nominate President Franklin Pierce for a second term. Senator Stephen Douglas of Illinois, the author of the Kansas-Nebraska Act seemed to be a strong contender for the nomination, but he was passed over for James Buchanan of Pennsylvania. Buchanan was very well qualified to part the job of chief executive, at least in theory. He had been serving as American ambassador to Great Britain at the time he was nominated and had previously held the posts of Secretary of State under President Polk, U S Senator from Pennsylvania from 1834 to 1845; where he served as Chairman of the Committee on Foreign Relations, Ambassador to Russia under President Andrew Jackson from 1832-1833, and Congressman from Pennsylvania from 1821-1831. Buchanan had also served as a private in the Pennsylvania militia during the War of 1812. Despite his long career of service to his country, Buchanan was not particularly distinguished as a leader and the most likely reason he was nominated was because he had been out of the country during the controversies surrounding the Kansas-Nebraska Act and Bleeding Kansas. Buchanan was not known to have said anything about the issue of slavery that would upset the South and although he was a Northerner, he seemed sympathetic to the South and its peculiar institution. For Buchanan’s running mate, the delegates selected John C. Breckinridge of Kentucky, who had been a Congressman from 1851-1855. Breckinridge would have preferred not to be nominated as Buchanan’s running mate, as he had supported Pierce and the two men did not get along, but he acquiesced. The Democrats went on to adopt a platform of popular sovereignty on the slavery question and support for the Ostend Manifesto which called for the acquisition of Cuba from Spain. The Republicans met for their first national convention in Philadelphia of June 17. The Republican party was formed from a coalition of former Whigs, Free-Soilers, and anti-slavery democrats to oppose the Kansas-Nebraska Act and was formally launched at a mass meeting at Jackson, Michigan back on July 6, 1854 and quickly began to win elections throughout the North that fall. The Republican Party was an explicitly anti-slavery party, but they didn’t call for the abolition of slavery where it existed, only for slavery not to expand into the western territories. The Republicans chose the famous explorer and military hero John C. Fremont to be their presidential candidate. Fremont was known as “The Pathfinder” for his expeditions in the west and had captured California, during the Mexican War and had briefly served a contentious term as military governor there. After the was, Fremont had settled in California and served as one of the new state’s first Senators from 1850-1851. Fremont was not particularly well qualified to be president, but he did have a catchy slogan, “Free Soil, Free Speech, Free Men, Fremont”. The Republicans went on to pick former New Jersey Senator William L. Dayton as his running mate. Millard Fillmore as their candidate, even though he had not been a follower of their movement and was, in fact, out of the country. They selected Andrew Jackson Donelson as their Vice-Presidential candidate.There were also the remnants of the Whig Party which met in Baltimore in September, They also nominated Millard Fillmore. Along with the debate over slavery, there was the usual nineteenth century campaign hoopla, with parades, mass meetings, speeches, and political clubs. The Republicans did not run in the southern states, which were expected to vote for Buchanan and the Democrats, so most of the campaigning was in the North and West. The Republicans opposed the extension of slavery into new territories and appealed to western farmers who did not want to have to compete with slave labor and eastern businessmen who supported high tariffs to protect American industry and fund internal improvements. Mainly of these businessmen supported the Democrats, however, fearing possible economic disruption if the Republicans won. The Democrats appealed to racism, calling their opponents “Black Republicans” and warned that the South would secede in the event of a Republican victory. They also claimed that Fremont was secretly a Catholic. Oddly, this did not help him get the Catholic vote, since the Catholics somehow believed that he was connected to the Know-Nothings. In the end, the people of the North decided that they feared disunion and civil war more than they disliked slavery. Buchanan got 1,836,072 popular votes (45.3%) and 174 electoral votes, sweeping the entire South, California, and Illinois, Indiana, Pennsylvania, and New Jersey in the North. Fremont did not do too badly considering that this was the Republicans’ first national election. He won 1,342,345 popular votes (33.1%) and 114 electoral votes, winning the rest of the North. The American Party also did surprisingly well with 873,053 popular votes (21.5%) and they won the state of Maryland with its 8 electoral votes. The fact that the results were divided upon sectional lines was more than a little ominous, as were the Southern threats to secede if the election wouldn’t go their way. At his inauguration, President James Buchanan spoke of the nation’s bright future of economic progress and territorial expansion. About the slavery issue, he only said that he supported popular sovereignty in the territories and hoped that the upcoming decision by the Supreme Court on Dred Scott v. Sanford would settle the matter once and for all. Just two days later, the Supreme Court rendered its decision declaring that Congress had no power to regulate slavery in the territories, and all hell broke loose. I really didn’t expect Donald Trump to win this election. Actually, when he first won the nomination, I thought Trump had a fair chance of winning, particularly since Hilary Clinton is such an unattractive candidate. But, as the campaign progressed and the polls and Nate Silver‘s FiveThirtyEight consistently showed Clinton in the lead and after all the embarrassing things that Donald Trump had said in the past came out, I started to believe that he didn’t have a chance. To be sure, there were the Wikileaks revelations, but I counted on the media not to report on anything likely to harm Hilary Clinton’s chance of winning. It didn’t seem as if the increasing evidence of her corruption and contempt for the voters would make much of a difference. I am glad to say that I was wrong. I am not a supporter of Donald Trump. I would have preferred that just about any of the other Republican contenders had won the nomination. I voted for Trump mostly because I did not believe that a person who has apparently broken federal laws safeguarding our national security should be rewarded by being given the highest office in the country. Why were the polls and the experts wrong? Not all of them were. Scott Adams was predicting a Trump victory even before he secured the nomination. I think that Ann Coulter and Sean Hannity were Trump supporters all along and there were signs of discontent with the nomination of Hilary Clinton in traditionally strong Democratic states like Michigan and Wisconsin which went to Trump. Still, almost all the polls consistently showed Clinton in the lead. I suppose media bias played a role. There are ways of slanting polls to get the results you want and I don’t think any candidate was been so generally despised by the mainstream media as much as Donald Trump. The media has alway been biased in favor of the Democratic candidate, but this year they seemed to lose even the pretense of objectivity. This is understandable, since if a candidate is a racist monster, the second coming of Adolf Hitler, than any means, including deception, are permitted to stop him. There may have been more than a few people in the media willing to deliberately slant the polls or lie about the outcome, for a good cause. I wonder, though, if the pollsters who depend on a reputation for accuracy would go along. Perhaps this was more a case of wishful thinking and unwillingness to go against conventional wisdom than deliberate deception on the part of the media. The people who were dishonest may have been the people who were planning to vote for Trump. There was a stigma attached to openly supporting Trump in some places. Supporters of Trump risked ostracism, loss of opportunities, and even violence against their property and persons. There might have been millions of Trump voters who kept quiet, lied to pollsters, and then voted for Trump in the privacy of the voting booth. I hope that the Republicans learn the right lessons from Trump’s victory. Probably the only thing about Trump that I have found attractive is his willingness to fight. Too many Republicans, particularly presidential candidates are not. They try to curry the favor of the media, even though it is implacably hostile to them. Trump treated the reporters with the contempt they deserve. When they are attacked as racist, sexist, homophobic bigots, most Republicans back down and apologize, even when they have said nothing that could be construed as bigoted except in the minds of their opponents. Trump did not back down and apologize. He kept on attacking. Previous candidates were either too nice to fight back. like Mitt Romney and the Bushes, or used to media adulation for betraying their fellow Republicans, only to be shell-shocked when exposed to the full force of media bias when they run against a Democrat, like McCain. Trump is not nice. To be sure, his tendency to attack got him into trouble when he took things personally, but there ought to be a happy medium between being too aggressive and not aggressive at all. I hope that a less flawed and more disciplined Republican candidate will be able to find that medium. I don’t think there is much 0f a mystery why Trump won. There are a lot of Americans who feel that they have been left behind and forgotten, that the leadership of both parties have been ignoring their needs and concerns. There are millions of Americans in so-called flyover country who believe, with good reason, that they live in a country whose leaders have rigged the economy to benefit themselves at the expense of ordinary Americans. Even worse, it is becoming increasingly obvious that these elites view ordinary Americans in fly-over country with contempt. Their religion and moral are mocked in the entertainment media. Their concerns are derided as bigotry. They have begun to feel as if their country has been taken away from them. These Americans may not have liked everything Donald Trump had to say, but the fact that the elites that despise them also hated Trump must have seemed to be a good reason to support Trump. He has the right sort of enemies. The way in which the anti-Trump protesters have been acting seems to vindicate their support. I don’t know what kind of president Trump is likely to be. I don’t think that he is going to be the unmitigated disaster some are predicting. I doubt he is going to end up in anyone’s list of top ten best presidents. He couldn’t be worse than Barack Obama has been, or Hilary Clinton would have been. We’ll have to wait and see. 27 years after Berlin Wall fell, new US president-elect promising 1 of his own (stripes.com) The difference is that East Germany built the wall to keep its people from leaving.